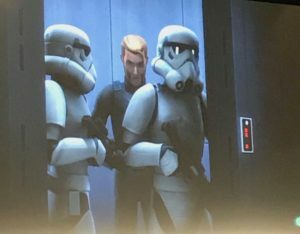 On Saturday morning at Star Wars Celebration fans of the animated series Star Wars Rebels were treated to a sneak peek of Season Four. We also got to see a trailer and listen to a panel discussion from the creator and stars of the show. 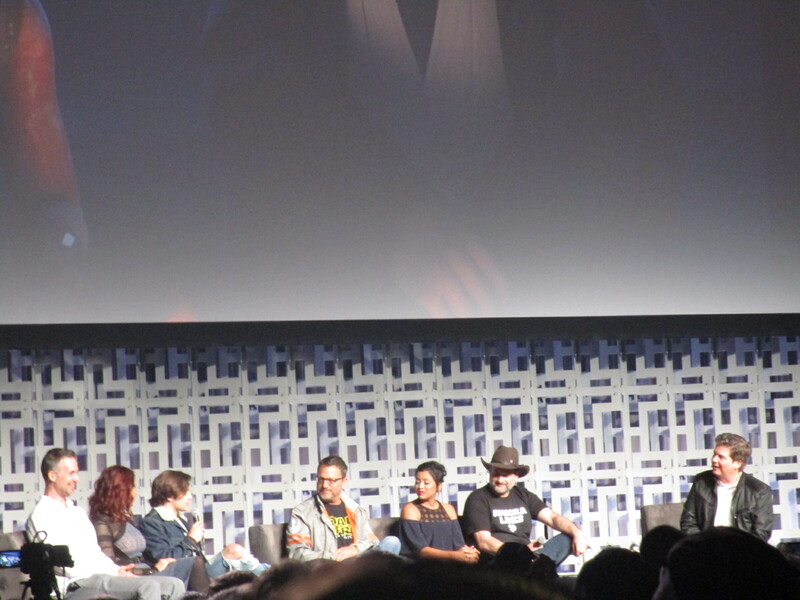 On the panel was executive producer Dave Filoni, Taylor Gray as Ezra Bridger, Vanessa Marshall as Hera Syndulla, Steve Blum as Zeb Orrelios, Tiya Sircar as Sabine Wren, and Freddie Prinze Jr. as Jedi Knight Kanan Jarrus. They went on to discuss their characters in Season Three and the upcoming Season Four. What will we expect? 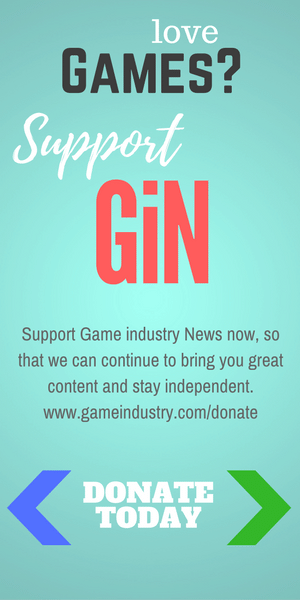 From the discussion the characters are continuing to grow and amazing things will come out of it, we will also see returning and new characters. This is evident in the epic trailer for the new season. 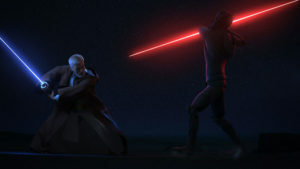 In Season Three the audience got to watch Ezra deal with his conflicts from his meeting of Darth Maul and brush with the darkside to grow into a powerful Jedi and rebel. Kanan had to deal with his blindness and almost losing Ezra. After meeting the Bendu on Atollon, Kanan was shown his true path and that he must go back and be a teacher to Ezra. The Bendu was a force being in the middle between light and dark. 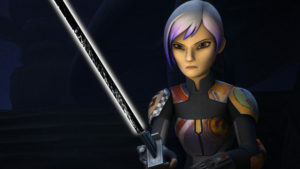 Sabine Wren had an amazing character arc in Trials of the Darksaber where she learns to wield the darksaber. Sabine Wren with the darksaber. The darksaber is an ancient black-bladed lightsaber created by a Mandalorian Jedi named Tarre Vizsla. In the Clone Wars Pre-Vizsla was the last to carry the saber but lost it to Darth Maul during their epic fight. It was later found on Dathomir when Darth Maul lead Ezra there for the vision that eventually lead them both to Obi-Wan. Sabine knew of its history and importance. Knowing it can unite the Mandalorians she was convinced to train with it by Kanan. She found her strength when all her past came to the surface and a determination not seen before was revealed. Following her training she brought the darksaber home to her mother and clan Wren, now in service to the empire and Gar Saxon. Defeating Gar Saxon Sabine stayed behind to fight for her clan and liberate other clans from the Empire. 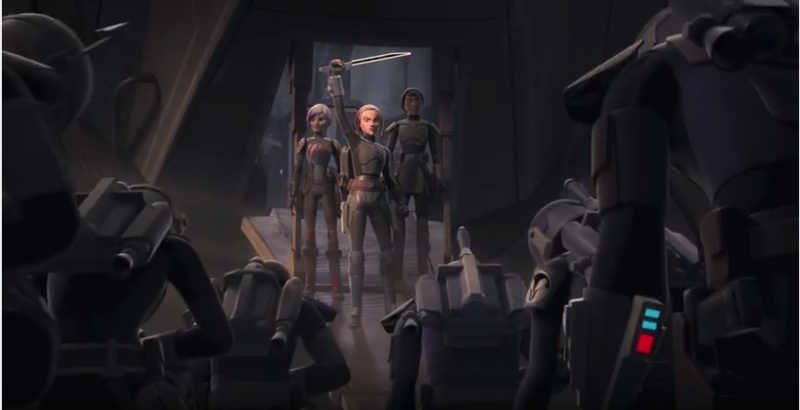 In the trailer for Season Four we get a glimpse of Bo-Katan Kryze returning from the Clone Wars series. In Clone Wars she was a lieutenant in the Death Watch and Duchess Satine’s sister. Duchess Satine Kryze was the Duchess of Mandalore and a pacifist. However, Bo-Katan wanted to return Mandalore to its roots as a militaristic culture. In the trailer we see Bo-Katan with the darksaber and Sabine. One of the biggest and anticipated episodes in season three was Twin Suns. Taylor Gray was amazed by the experience. It was an amazing episode were Ezra is drawn to Tatooine by a recording of Obi-Wan the broken holocron. Darth Maul was also drawn to Tatooine by his force vision. The episode itself was partly about Ezra defying orders to go find Obi-Wan and Darth maul. However, the story was really about the end of the Obi-Wan and Maul story. Obi-Wan and Darth Maul with this episode ended an arc that started with The Phantom Menace with Obi-Wan finally taking out Darth Maul and ending one evil in the galaxy. Ezra finally meets Obi-Wan but they depart. Dave Filoni discussed his vision for Maul and felt it was only appropriate for Obi-Wan to take him out. It was an end to an arc and a story about selfishness versus selflessness not just light and dark. Maul was consumed by revenge for Obi-Wan defeating him on Naboo. He became selfish in his nature, consumed by his passions. When Obi-Wan confronted him he knew that the only right thing to do was to put an end to Darth Maul. Obi-Wan succeeded because he had let go of his passions and was selfless. This was the failure of Anakin; he was consumed by his passions. 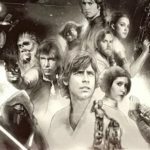 Direct from Dave Filoni it is confirmed that the boy running in the silhouette at the end of the episode was Luke Skywalker. At the end of the Tatooine scene Obi-Wan is looking on to the house and the boy as protector to Luke and the future of the galaxy. 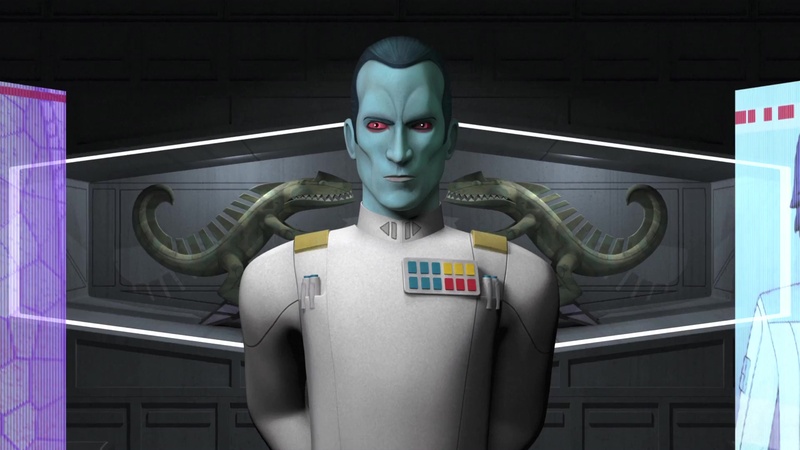 There is one character that stood out from all others and reintroduced to fans and that was Grand Admiral Thrawn. The Chiss imperial officer is the best strategist and tactitican in the Imperial ranks and was brought in by Governor Arihnda Pryce to defeat the Lothal rebels after numerous attempts have failed. He studies his enemies through their art, culture, and philosophy to find vulnerabilities and learn their next moves. First introduced to us in Heir to the Empire by Timothy Zahn, Thrawn, also known by his Chiss name Mitth’raw’nuruodo, was apparently always in discussion to be in Rebels. He is after all a fan favorite. However, Dave wanted to do it right and used in a meaningful way without changing Zahn’s character. Because the Grand Admiral studies art the artistic talents of Sabine could undermine the Rebels and this was something that had to be dealt with in the series. Another was when Thrawn got ahold of Hera’s family heirloom, her family’s Kalikori, when her they were fighting to retake back Ryloth in Hera’s Heroes. He also confronted Hera, but eventually let the Rebels go though kept the heirloom for study. Thrawn is voiced by Lars Mikkelsen and did an amazing job with the character. He was a former Chiss Commander and joined the Empire after being exiled. Eventually he became a Grand Admiral in a very human-centric Imperial Navy. They needed a voice that reflected him as an alien but also as a military strategist and commander. It worked and Lars convinced us that he is the Thrawn Timothy Zahn created. Another new character was the Bendu. Freddie Prinze Jr. discussed Kanan’s relationship with the force being, voiced by Tom Baker. Going into the episodes with Kanan and the Bendu Freddie said he was another teacher for Kanan. In Season One it was the Grand Inquisitor and Season Three it was Darth Maul. Now in Season Three he had a more decent teacher in the Bendu. For Kanan the Bendu was literally teaching him how to survive. He was blinded and lost hope but the Bendu gave him a new sight and strength to continue training Ezra and leading the fight against the Empire. He also goes on to train Sabine while Ezra becomes stronger then maybe even Kanan. 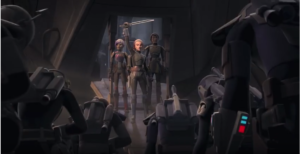 The Sabine episode was an incredible arc and the way the panel discussed it maybe the best part of the entire season. It was Tiya’s turn to speak and she was surprised by the episode and getting a lightsaber as a non-force user. In Trials of the Darksaber it was interesting for her to explore this part of Sabine’s life. It was a new side to the character. Sabine is vulnerable as she releases her secrets and fears that made her who she is but overcoming those fears made her stronger. Releasing those fears made her strong enough to wield the darksaber. The panel did go on to talk about Agent Kallus. 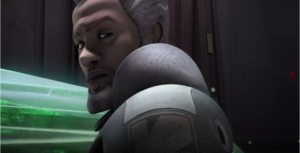 Agent Kallus, voiced by David Oyelowo, started off as an enemy but then after being stuck on the ice moon with Zeb began to rethink his life and purpose as an Imperial. He had a change of heart and became the new Fulcrum after Ahsoka left the show. During the episode Zero Hour: Part One Kallus learned of Thrawn’s plan to find the Rebel base and tried to warn them on Atollon. During transmission Thrawn stopped him and took him in custody. After his fight with the Grand Admiral, Kallus’s character had a misplaced strand of hair starting an Internet sensation called #HotKallus. Dave Filoni joked around about how one misplaced strand can change everything. 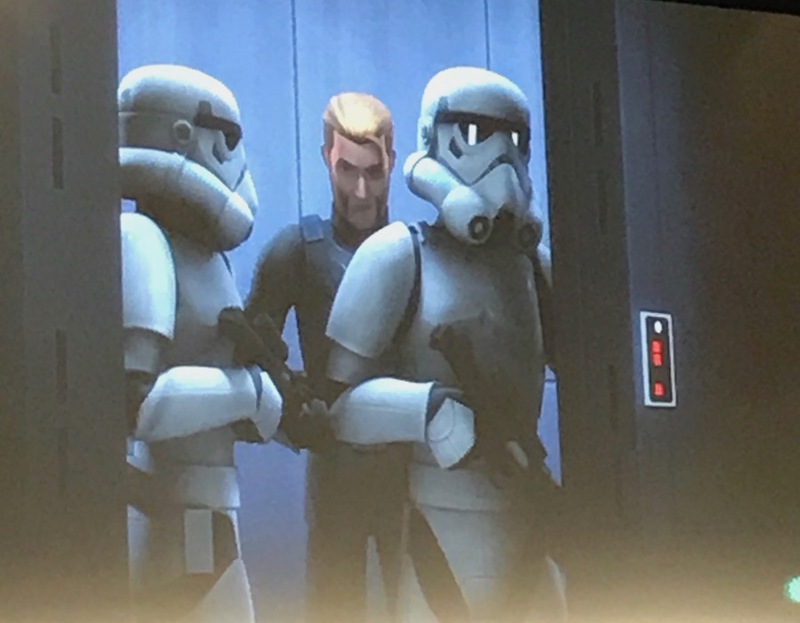 In the trailer for Season Four we finally see Kallus as a Rebel. 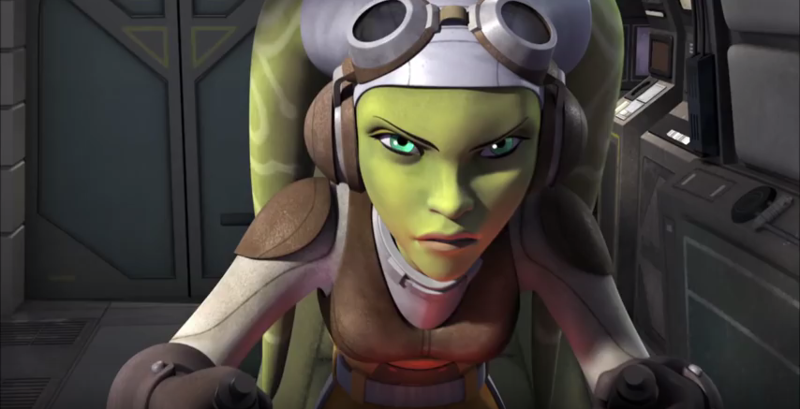 Where are our Rebels going in Season Four? The panel discussed as much as they can about their characters and what we might see. Vanessa talked about Hera having the same agenda with a sharper focus as in previous seasons. She is impacted by the losses in Season Three and it made her more committed more than ever to get the job done and continue to lead the fight. As for Zeb, he is going to be a more responsible citizen then just a “tough muscle head”. Steve Blum also says that Zeb makes smarter choices and is not just a guard for Chopper base. Chopper is getting off from being in Rogue One but more will be revealed about his character in Season Four. Though he never really gets an arc he has a big heart and likes the Rebels. Bo-Katan with the darksaber, Sabine, and Ursa Wren – Sabine’s mother. 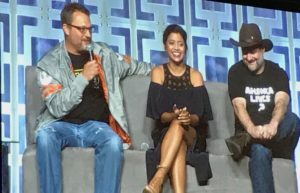 Sabine’s character will make Mandalorian fans happy with her episodes and Tiya says we will be surprised where she ends up. In the past season she had her own insecurities but grew in to this capable person. Though she still has issues with her Ghost family and now issues with her other family, which will be seen more in Season Four. In the trailer we see many Mandalorians and Sabine still holds the darksaber till near the end of the trailer. Kanan is still blind but Trials of the Darksaber defined who he is and who he needs to be. According to Freddie he goes from “cool uncle” to a disciplinarian with Sabine. At first he didn’t believe in her based on her early character but when she comes back to continue her training from giving up on the darksaber Kanan is hurting as much as Sabine is. This was a trial and learning period for both characters and they grew stronger together. Even though he has grown in character when it comes to Ezra he is not sure how much more he can teach the young Jedi. Ezra grew up throughout the series and we saw him grow up more with his brush with the darkside. In Season Four he decides on what kind of Jedi and person he wants to become. His story from the beginning was a coming of age story where he learns his abilities and how to be selfless and in Season Four, according to Taylor, he will make good decisions. As for other characters coming back we will see Mon Mothma return along with Saw Gerrera. Saw’s character in the season will continue to bridge the gap between Clone Wars and Rogue One. 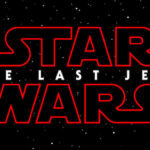 We also are going to get to see a U-Wing in the season. The season from looking at the trailer is beginning to transition to Rogue One with a darker tone and grittier feel. 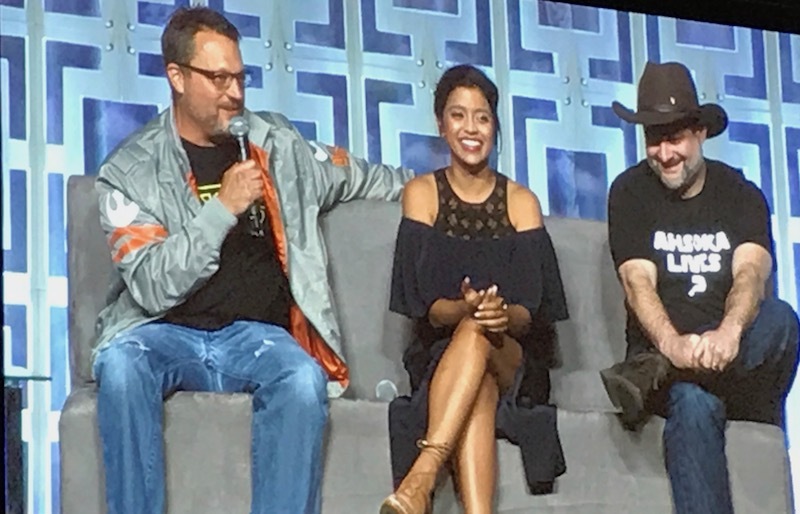 Another character that Dave Filoni reintroduced fans to and will appear in the upcoming season is Thrawn’s Noghri assassin Rukh. He made his first appearance in Heir to the Empire. Warwick Davis will be voicing the character who is said to be creepy and devious. 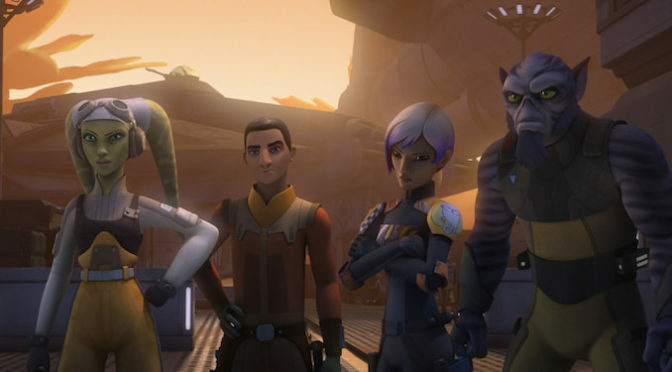 The last bit of news is this will be the final season of Star Wars Rebels. Dave knows what it is like to not finish a series. The show Clone Wars never had a true ending but now he can conclude this show in a meaningful way. He also hinted that this is not an end to what they are doing in animation. Watching the trailer we see that the rebellion is going to fight back with allies like Saw against the Empire and Thrawn’s forces. What is known is the characters are going to develop further and we will see them finish up their stories as we progress into the era of Rogue One and the Original trilogy. 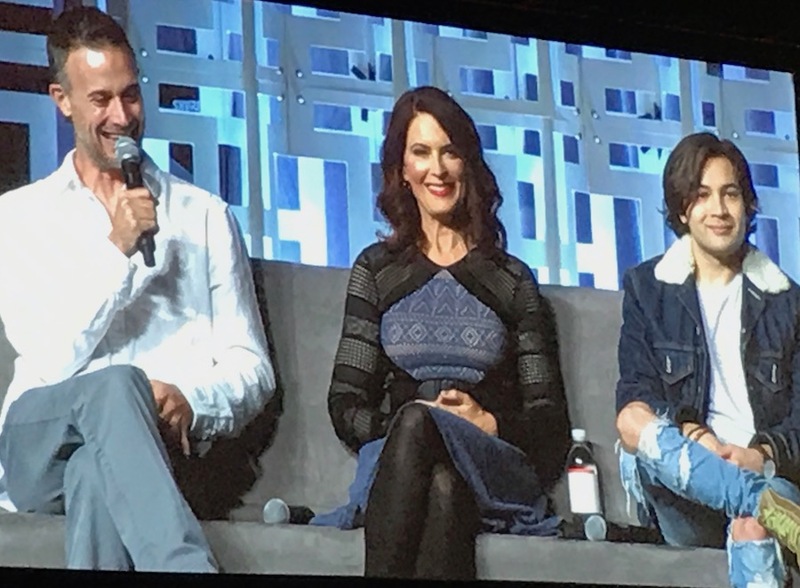 The actors of Star Wars Rebels at Star Wars Celebration. 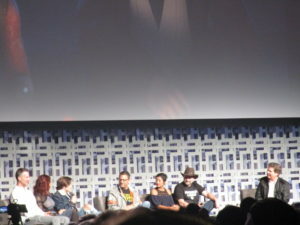 Left to Right: Freddie Prinze Jr, Vanessa Marshall, Taylor Gray, Steve Blum, Tiya Sircar, Dave Filoni, and the host David Collins.